Today I wanted to take the time to tell you a little about a site t. The name of the site is Points2shop. Not only me, but also the fans of my site got a lot of facebook gift card($10-$50) from this site. This isn't a 'Get Free Things' site. In fact, nothing in life is free. However, this is a site that you can use to EARN things like facebook gift card that you would otherwise have to pay for. Points2shop is a website that works with amazon.com. 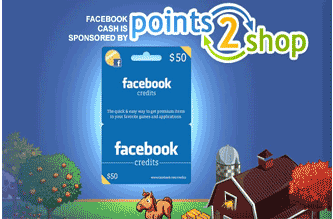 By completing offers you will get points to EARN FREE rewards. You can also do quest to earn points do team competitions or play games. There are different ranks on how many quest you complete. I know, you're probably thinking 'How is that possible!' well, its possible because advertisers place their links on the points2shop website. Then members like myself go and complete the offers that we are interested in. When i do an offer, points2shop gets paid for bringing me to that advertisers website. When points2shop gets paid, they give me a portion of that payment so that i can then get things from amazon.com. Fans of my page has received multiple rewards using this method. If you think its a scam and don't even try it thats your fault, no free gifts for you. But if you wanna give it a shot click my link and you will be my friend automatically. If you have any problems send us a message on Points2shop/Cashle. After you register on site you must confirm you're registration by checking you're email. Complete offers and start colecting points for gold. You juste need a couple minutes every day. I was think "This doesnt work" but I looked better,and i found some deals that work well, and you can earn a lot of points, which can later turn into gold for Marvel Avengers Alliance. Do not forget to confirm email. Remember: 1000 Points = 10 $ and 10$ = 42 Gold. You are now ready to start begin your journey to your first gift! To start earning your points, go to 'Main Offer List'. It works to an extent. Theres too many offers that take forever to get approved. You will eventually have a list of pending offers for weeks sometime before you even see your points. I suggest just knockin' out as many "free offers" on Facebook to get gold than doing the "points2shop" crab,..just being honest! Oh it works but the only problem is the waste of time doing surveys etc.... you are told accepted for a survey then it asks you more questions then tells you sorry you do not qualify..... again the potential is there but I would rather spend time on the avengers game building up things than waste it on another site that only tells you one thing then another after you spent the time. Does it work for Europe? Its not fake.. I have gotten 60 gold so far and that was in my first 15 minutes of using the site. I am saving up for a much bigger prize now. It takes a little effort, sure.. but what doesn't? It is easy to earn 5 dollars worth of cash or points in a day. in 3 days that is a $15 dollar facebook card which = 60 Gold. Now that does not sound like a lot, but 1) its more than doing nothing and getting zero and 2) that's with little effort. They have a proof section from users that uploaded photos. Nothing is free.. but with a little effort even the smallest rewards are much better than nothing. :) If you don't do it.. cool have fun not having gold or having to pay direct money for it. If you have spare time and want stuff its easy.